The path to a successful career had been relatively easy for Lanza. Having discovered he had a voice, he started working with a coach at the age of 19. 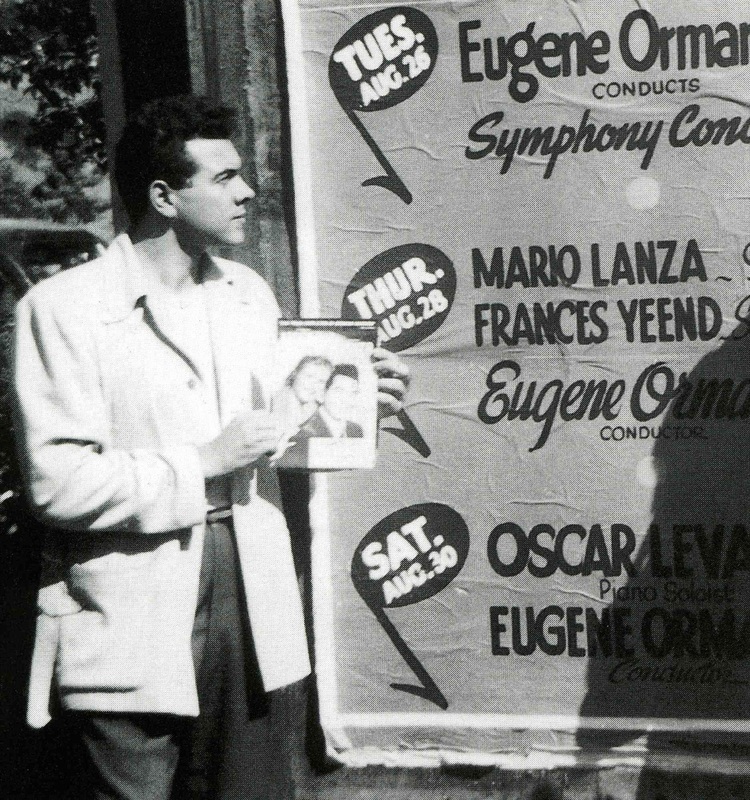 Two years later he auditioned for Serge Koussevitzky, the great conductor of the Boston Symphony, who immediately awarded him a scholarship to study in Tanglewood, the summer home of the Boston Symphony. Lanza made his debut as Fenton in the The Merry Wives of Windsor to rave reviews, but shortly after his studies were interrupted and he was inducted into the Army for the next two years. While serving as a GI, he took part in Army shows that included Winged Victory on Broadway. In the meantime, he had been signed to an exclusive contract by the giant RCA recording company, and by Columbia Artist Management, who would handle his concert and opera appearances. This brings me to 1947, and the time when Lanza signed the contract with MGM. At this stage of his career, Lanza was heading only in one direction: the operatic stage. Since arriving in New York, he had studied with the best--Gigli's teacher Enrico Rosati--and had sung over 100 concerts, getting absolute rave reviews. The sort of reviews that most singers can often only dream about, in fact. His goal was certainly not the MGM Studios. His lifelong ambition was to become a great opera singer. Unfortunately, at the time he thought he would be able to do both: make films and sing opera. And he probably would have been able to do just that if he hadn't become an overnight success with his first film, That Midnight Kiss. Such was the impact that Lanza made on the public and critics alike in his first film appearance that MGM paid him twice what his contract called for--50,000 dollars instead of the agreed 25,000 dollars. The studio immediately followed up with a second film, The Toast of New Orleans, which was an ever bigger hit. More than two million records were sold of 'Be My Love', one of the songs from the film. It was the first time in the history of RCA that a classical artist had sold more than a million copies of a single recording. In Lanza MGM had found a tenor with the rare combination of a great voice, good looks, and charisma. They had found a tenor who could play the immortal Enrico Caruso, and The Great Caruso became Lanza's third and most successful film, earning a fortune at the box office. The song 'The Loveliest Night of the Year' became Lanza's second gold record and that year, 1951, he was voted America's most popular singer, while his earnings for the year surpassed one million dollars. With only three films and little more than four dozen records to his credit, Lanza had become a household name. Offers were pouring in from all corners of the globe. There were more concerts, more recordings, more films, radio appearances, and inevitably offers to sing opera. But to sing opera takes time; you have to study the role. First with a coach and then with conductor and orchestra. To learn and rehearse a role in an opera can take months. Once in Hollywood it was impossible for Lanza to study a score. He had in fact sung two performances of Pinkerton in Madama Butterfly in New Orleans just prior to moving to Los Angeles. Again, the reviews were excellent and they wanted him back the following year to sing Alfredo in La Traviata. Too late, for the Hollywood machinery had taken over. After his enormous success as a film star and recording artist, the critics and a section of the public began to voice their disapproval. "Why is he making movies instead of singing opera?" he was beginning to struggle with his own artistic conscience. But having become world-famous in the span of only two years, and having been compared with the likes of Caruso, made the prospect of a major operatic debut unthinkable. 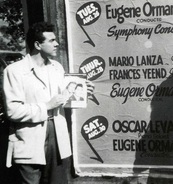 Had Mario Lanza made his Metropolitan Opera debut in 1948, it would have attracted only the attention of the opera-going public. By 1951, however, it would have caused world headlines and the resultant scrutiny of public and critics alike. No artist would have risked his reputation, and possibly his entire future career, by making a major debut. The standard practice for opera singers hasn't changed. A debut takes place in one of the minor opera houses and this is followed by four or five years' singing and gaining confidence and experience in a variety of roles in the provincial opera houses. Only then is the singer ready for a major debut. But equally absurd would have been the notion of the world-famous Mario Lanza singing in the provinces. It was too late for that. So while Lanza was riding high as far as popularity and commercial success were concerned--not to mention the huge financial rewards--he was beginning to struggle with his own artistic conscience. His dream, his goal, had always been the operatic stage where his great predecessors had sung, so Lanza began to feel a sense of guilt that in time grew to gigantic proportions to the point of ultimately destroying him. Disagreements with the studio made him indulge in overeating, and the eating binges were followed by stringent crash diets demanded by the studio so that he would photograph well for the cameras. The constant dieting began to affect his volatile personality to the point that following a disagreement with MGM after having recorded the soundtrack for his next film, The Student Prince, he walked out of the production and was subsequently fired by MGM. This was a blow from which Lanza would never fully recover. Any prolonged absence from live singing only accentuates the anxiety, the fear of facing an audience. Extremely sensitive, he believed that things could be worked out with the studio. When this didn't eventuate, Lanza was shattered. Having severed his links with MGM this would have been an opportune time for him to devote himself to an operatic career. Instead the outgoing Lanza withdrew into himself, refusing to see any one apart from his immediate family and a few close friends. For the next two years he lived as a recluse, constantly drinking and overeating. His self-image had been severely damaged and the once self-assured singer was now extremely insecure--to the point of miming to some of his old recordings in an ill-judged television appearance after two years of inactivity. Money problems also made him accept a lucrative Las Vegas engagement, which he failed to fulfill at the last moment due to stage fright.